Post Crown, why do I need this? This is used when none of the tooth is left but the root is still viable, (intact). This prevents bone absorption and promotes the health of the adjoining teeth. In modern-day dentistry, there is a wide variety of dental materials to choose from. Some crowns are made from full gold, where as others are made from an alloy of metals fused to a porcelain outer shell. After time, crowns that are made from a combination of metal fused to porcelain can begin to show dark gum lines that are not aesthetically attractive. All-porcelain or -ceramic crowns are the best choice for a natural cosmetic look. There are many different brands and types of porcelain crowns, and the variation between the costs of dental crowns reflect the quality of the materials used. Once you have had a consultation with your dentist and discussed all the treatment options, he/she will prepare the tooth for crowning. The first stage is to clean the tooth, remove any decay and reshape it using a burr (a special dental drill for shaping teeth) under local anaesthesia. 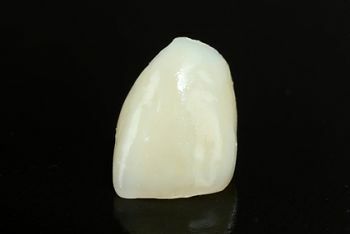 The shape of the prepared tooth is usually tapered to allow the crown to sit comfortably over the top of it. Once the tooth is prepared, an impression (mould) of your teeth will be taken using a special “dental putty”. This impression is sent to a dental laboratory, which will use the impression of the prepared tooth as a guide to fabricate the new crown to fit perfectly. It usually takes between two to three weeks for a laboratory technician to custom-fabricate your new crown. During this time, your dentist will fit you with a temporary crown to cover and protect your prepared tooth.